STOCKBRIDGE – Although the road less traveled was the one romanticized and immortalized by Robert Frost, who shall be our guide to multiple roads traveled at the same time? The young British playwright and screenwriter Nick Payne, that’s who. His “Constellations’’ is a fascinating drama about love, fate, parallel universes, simultaneous states of being, and the infinite possibilities of any human life. A small gem that runs a little more than an hour, Payne’s play was staged on Broadway last year, starring Jake Gyllenhaal and Ruth Wilson. 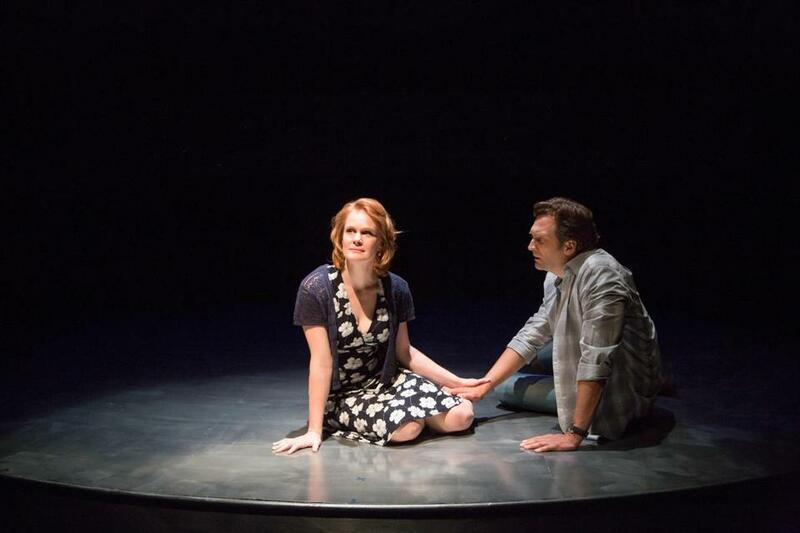 But it’s hard to envision performances more subtly piercing than those delivered by Kate Baldwin and Graham Rowat in the quietly spellbinding production of “Constellations,’’ directed by Gregg Edelman, that is now at Berkshire Theatre Group. This makes it three years in a row that Baldwin and Rowat, who are married, have anchored a highlight of the summer theater season. The duo memorably paired up in “A Little Night Music’’ (2014) and “Bells Are Ringing’’ (2015), two musicals that could scarcely be more different in topic and tone, both also presented at Berkshire Theatre Group. You might say that the music of the spheres is the subject of “Constellations,’’ a love story that is steeped in and governed by quantum physics and string theory. (An understanding of which, I hasten to add, is not required to appreciate the play. If it were, I would not be the one writing this review. Parallel-universe Don, who paid attention in science class, would have taken over). Notably, there is nothing cosmos-shaking about the love story in “Constellations’’ — make that love stories — or about the two people at its heart. John Updike once noted that his goal as a writer was to “give the mundane its beautiful due,’’ and playwright Payne seems to share that appreciation for the quotidian, while also underscoring that the mundane is anything but. Marianne (Baldwin), a somewhat jittery academic who specializes in what she calls “theoretical early universe cosmology,’’ and Roland (Rowat), a stolid beekeeper, do not necessarily seem made for each other. Yet there is something profoundly moving about the way their love endures. So “Constellations’’ rolls the dice. First, we witness their awkward first meeting, at a friend’s barbecue. Then we see several alternate versions of that meeting, with a key detail or two different each time. And then the play suddenly leaps ahead in time, when Marianne is grappling with a serious illness, and then back in time, to when Marianne is trying to decide whether to sleep with Roland for the first time. Ultimately, the couple has to cope with episodes of infidelity, though the guilty party is different, depending on the scenario. Mind-bending though it is to contemplate, each scenario is taking place in a different universe as their romance unfolds across time. Fittingly, the action in this multiverse takes place on a circular stage that somewhat resembles the face of a clock, and the carefully orchestrated movements of Baldwin and Rowat around that stage seem akin to the movements of a clock’s hands. Kudos to Alan Edwards, who designed the set and the lighting, the latter of which is especially crucial to signaling when Marianne and Roland have changed universes. Ethereal music from resident composer and sound designer Scott Killian lends the production an otherworldly quality. As the play makes its fragmentary, non-linear way toward a fraught decision Marianne must make, “Constellations’’ movingly reminds us that a word, a glance, a silence, an action or reaction, can make all the difference. Frost would approve.